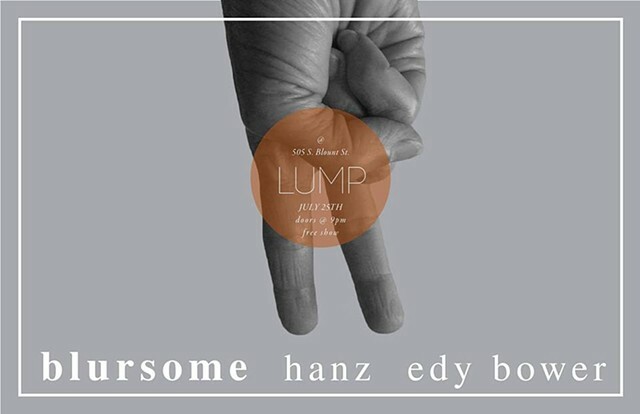 Lump is pleased to announce a free concert of three vanguard producers featuring blursome, HANZ and Edy Bower on Friday, July 25th at 9pm. Over the past year, blursome has taken to Soundcloud to release a series of impressive tracks. They are uncluttered, propulsive, and generally dark, and the entire selection conveys a skillful and patient approach from producer Lara Wehbie. Moreover, the compositions mark blursome as an artist to watch moving forward, especially with a premium slot at Hopscotch Music Festival and an official release from Locus Recordings in 2014. HANZ is the experimental project of Brandon Juhans. His music combines elements of sample based hip-hop and musique concrète to create a catalog of mechanical, nebulous and abstract compositions. His unique brand of beat production landed him an official remix for Alt-Jalong side Odd Future’s Internet and My Morning Jacket’s Jim James. Hanz recently self-released his debut full length album Reducer, which takes the principles of progressive producers such as El-P or The Bomb Squad and pushes their dystopian obsessions further into a wasteland fit for Snake Plissken. The live debut of Edy Bower, an all hardware house/techno/global mood music genie based in Raleigh.